Jeremy Corbyn has urged his MPs not to "engage" with the government over a Brexit deal after at least three prominent backbenchers took up an offer of talks with ministers. Their visits came just hours after Mr Corbyn had used a speech in Hastings to reiterate his demand that a no deal Brexit must be ruled out before he would take up Theresa May's offer of talks. In front of around 200 activists in Hastings he blasted the offer of cross-party Brexit talks as a "stunt", before being applauded by Labour supporters for saying that a second referendum was still an option. In signing off he said no deal would be "disastrous" and must be off the table, adding: "I urge colleagues to respect that condition and refrain from engagement with the Government until 'no deal' is taken off the table." 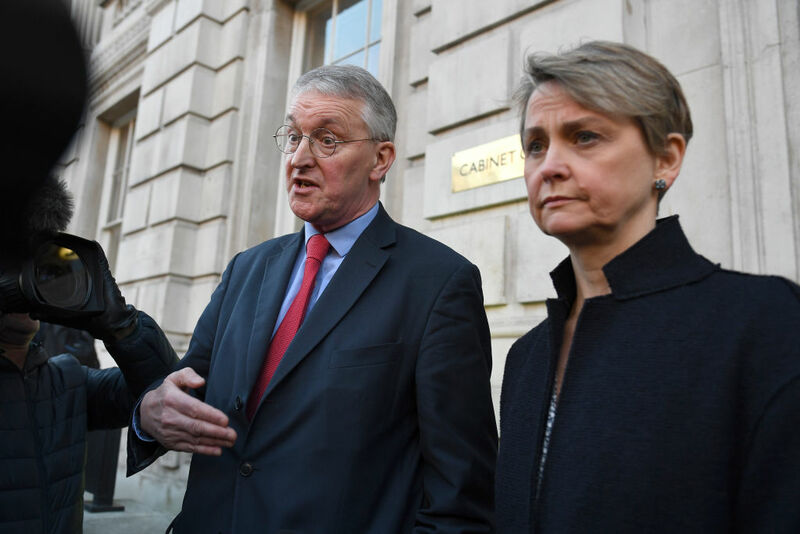 Both Mr Benn, who said he wanted to see if there was an "open mind" behind the offer of talks as he went in, and Ms Cooper echoed Mr Corbyn's demands on no deal as they left the Cabinet office later on Thursday afternoon. The chairman of the Exiting the EU Committee told reporters: "The government knows as well as anybody else the damage that would be caused by no deal so why continue to pretend that they might be prepared to take the UK out of the EU on March 29 without an agreement? "The essential first step is for the Government to say 'we will not do that because it's in nobody's interest for that to happen'." Ms Cooper, the Home Affairs Committee chairwoman, added: "I think the damage no deal would do would be so huge to our manufacturing industry, but also our policing and security, and that's why we had a vote in Parliament to say the Government should not be going ahead with no deal." He confirmed that Labour will table amendments to Monday's motion, putting forward its preferred solution of a customs union with a voice for the UK in future EU trade deals, a close single market relationship and protections for rights. He held open the possibility of an extension of the Article 50 negotiation period, saying: "Quite clearly, if no agreement has been reached within the time it could be implemented by the end of March, the issue of extending the exit date, extending Article 50, does come into play. Mr Mann, a Leave-supporting Labour MP and long-term Corbyn critic, came out of the Cabinet Office an hour after the leader's speech. Another backbench Labour critic, the east London MP Mike Gapes, criticised the party leader's attitude to talks, tweeting: "Apparently Corbyn is prepared to hold talks with Hamas, Hezbollah, Assad and Iran without preconditions. But not with the UK Prime Minister. Why?"